Skrunda Manor restaurant is opened every day from 12.00 - 20.00. We offer our guests and other travelers aromatic coffee or other drinks and special breakfast menus. The Skrunda Manor restaurant serves banquettes and individual guests. At the day time we offer menu at friendly prices, and in the evening the Skrunda Manor guests and other visitors are invited to have a lovely time, enjoying variable and delicious food and a well-thought-out wine list. During the warm season you can take pleasure in good food on the Manor terrace, opening a wonderful view of the Venta bend. Chief cook at our restaurant, will be pleased to create a menu in accordance with your wishes, type of the party and expected budget. 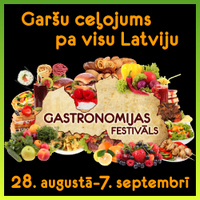 The menu will include foods of Latvian origin and products of local farmers. The Skrunda Manor confectioner will gladden festivity guests by fresh and qualitative delicacies and a wedding cake made in the Manor.